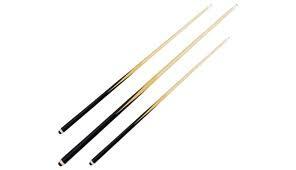 Supreme Pool Diner - Pool Table Services Ltd.
Supreme Pool Diner - Americal Pool Cues - Pool Table Services Ltd. This stunning SL dining / pool table truly satisfies the whole family's needs. Whilst not in use there is a beautiful light oak dining table with a 2 piece table top made out of one complete piece. 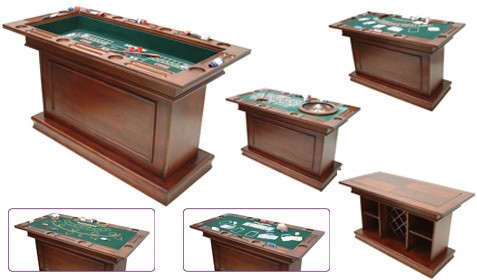 By removing the 2 pieces you immediately have a league standard slate bed pool table that is built to exacting standards. The slate is precision ground to give a true playing surface; the slate and cushions are covered in trade quality league cloth of your choice. Its square leg design also has channels in the design that compliment and match the channels on the top cabinet. 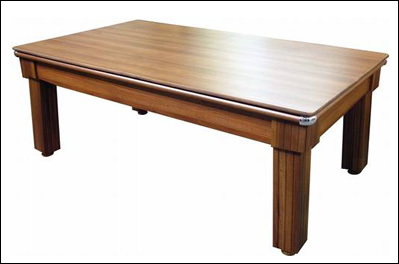 Each leg is fully adjustable via matching timber feet to ensure you have a level dining/playing surface at all times. All balls return to one end via the internal wooden ball channels and there is a silver trim around the ball return aperture with a metal chrome top frame corner detail. All in all, a truly memorable centrepiece for a home that will provide decades of use.